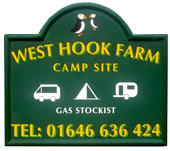 West Hook Farm Camping is run by Karre and Robert Thomas. 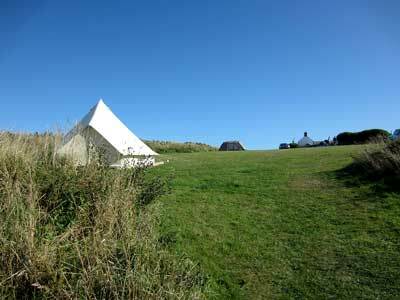 The farm and campsite is situated on the Marloes Peninsula, which is within part of the Pembrokeshire Coast National Park. It is a small campsite with clean basic facilities, which consist of 8 communal toilets and wash hand basins, 3 showers that work on 50p coins (the shower lasts approximately 4 to 5 minutes), 3 washing up sinks and a chemical disposal point. There are several fridges and freezers available to all campers. We also have picnic benches available for hire. We are open from mid-March to the end of September. The site does not have electric hook up, but we are happy to re-charge any type of battery from car to phone. We are a Calor and Camping Gaz stockist. The site has 30 pitches, which are set out over 4 acres of land. There is between 6 and 18 metres between pitches depending on position. Some pitches are on a gentle north facing slope. Turn Up Without Booking - You are very welcome to turn up without booking and just pay for the camping you require. If there is no available pitch we have an additional large field available that has plenty of space, but no dedicated pitches. The only disadvantage of this field is that it is further to walk to the facilities. Anyone wishing to stay less than one week cannot reserve a pitch. Reserve a Pitch - People wishing to stay for more than one week can reserve a pitch. A £30 deposit is required for this reservation, which must be received within 7 days of booking. The £30 deposit can be made by card, just give us a call on 01646 636424. Please note that no booking is confirmed until the deposit has been received. Touring Caravans: It is essential for touring caravans to be booked in due to Pembrokeshire Coast National Park Authority restrictions. The minimum stay for a touring caravan is 4 days. Please see our Prices for 2018. Details of our charges, including items for hire and facilities that are free of charge. Please read our Frequently Asked Questions. Email me if your questions are not answered there. Heavenly. The best sunsets, the most awesome stars. "Pembrokeshire has the world's best beaches" - says Kevin Rushby, who set out with his daughter and a vintage VW campervan to find the ultimate stretch of shore. "Now we were approaching our destination: West Hook Farm on the Marloes peninsula. This proved to be the best campsite we visited: basic but clean facilities, loads of space, and a glorious clifftop panorama. We jumped into wetsuits and ran 500m along the cliff path to reach Martin's Haven. This is a tiny stony cove best suited to snorkelling and rock-pool exploration. We swam out along the east side and were rewarded by a view of a big edible crab scuttling between the kelp. He evaded our hungry fingers".